Why is it that when I tried to center (align) the paragraphs in my blog (as opposed to aligning them to the left), the entire blog post expanded and stretched out to fill the whole page? Can you please give us a link to the page you are speaking of so that we can take a closer look. There is the link... I center aligned both paragraphs, a separate line, and a photograph (in a blog post) and it ends up stretching beyond the given parameters every time I try to submit a post. I'm sorry for the hassle, I've just never had a problem with this. Could you provide us with the web address to your site, as we are unable to access your site using the link provided. Thanks for the help, ladies. It's my latest blog post titled "Purses/clutches for the modern aesthetic...", you will see what I mean when I say I'm having problem with alignment... I hope. I have taken a look at your latest blog post and centered the picture in the post, how do you want the text to be aligned? If you can let me know I will give it a try. I would like the text to be centered, not aligned to the left... I took another look and my text stretches out so far that I need to use the bottom scroll and move it all the way to the right in order to see it... I would just like it to be centered over the picture, please. Thank you. 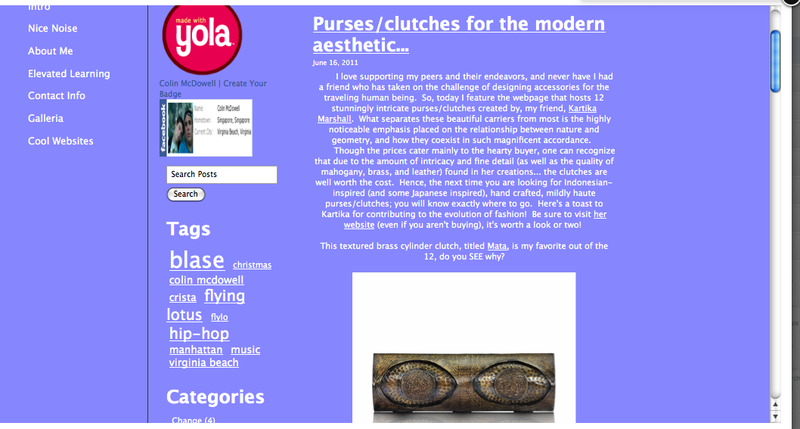 Thanks for posting the screen shot of how your blog page displays on your screen. I've checked in mine, and it displays the same as Emmy's. However, when I checked the HTML code of your blog, it looks as though you might have pasted from an external source directly into your blog. When you do this, it can cause problems with display and formatting. It might not show up right away and not in every browser. It looks like this is what we are seeing now. We have fixed the code on your latest blog post, but in future, you may want to keep this in mind. Here is a link to a tutorial which explains it in more detail: My site won't load in the Sitebuilder. Perfect, that explains it all. Thank you very much for your support and I apologize for making such a careless mistake. Cheers!